This supernatural story collection will make you reconsider everything you thought you knew. At night you'll hover under your covers while looking over your shoulder in the day. Down, down in the depths they fell; bodies in the dark of a liquid hell. From the thrilling author of Til Death Do Us Part and The 13: Tales of Illusory comes a second volume of twelve supernatural tales of ghosts, vampires, and things that go bump in the night. 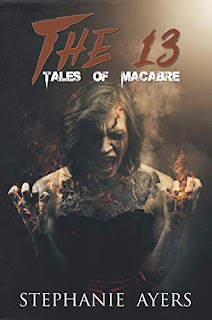 Ayers Creative Concepts is very excited to announce the publication of The 13: Tales of Macabre by Stephanie Ayers. Her words will jump from the page and haunt you once the lights go out. They will make you look over your shoulder during the day. This collection will make you question the “what if’s” in a whole new way. This second volume in The 13 series releases on Friday, October, 26th, 2018, and there will be a Facebook Halloween Party open to the public October 12-15, 2018. (link to event here). Stephanie has crafted each one of these hair raising stories with unique characters and plots that will catch you completely off guard. These stories will have you cowering under the covers and glancing over your shoulders before you’re done. You can learn more about Stephanie Ayers and The 13 by following along with the book blog tour which is on her website.